What They Say.....Meet Prinny, Chelsea and Diana. Prinny is the owner of Cosmos, a shop that sells crystals, potions, candles, and hope. It’s also a place where no one turns down a little extra-special cocktail that can work as a romance potion or heal a broken heart. But Prinny is in love with her married lawyer and she’ll need nothing short of magic to forget about him. Chelsea works as a living statue at tourist sites around Washington, DC. It's a thankless job, but it helps pay the rent. That, and her part-time job at Cosmos. As her dream of becoming a successful actress starts to seem more remote and the possibility of being a permanently struggling one seems more realistic, Chelsea begins to wonder: at one point do you give up on your dreams? And will love ever be in the cards for her? Diana Tiesman is married to Leif, a charismatic man who isn’t faithful. But no matter how many times he lets her down, Diana just can't let him go. She knows the only way she can truly breakaway is if she leaves and goes where he will never think to follow. So she ends up at Cosmos with Leif’s stepsister, where she makes her homemade teas and tinctures as she figures out whether she'd rather be lonely alone than lonely in love. In Beth Harbison's One Less Problem Without You, three women suddenly find themselves together at their own very different crossroads. It will take hope, love, strength and a little bit of magic for them to find their way together. What I Say......Today I got home after a very long day at work, where all I kept thinking about was going home and putting on my pajamas and doing nothing. However, as I got out of my car, my phone fell out of my purse, face down and the screen shattered. Shattered to the point that I was afraid I would cut my fingers if I tried to use it. So I walked and fed the dog and got back in the car to go to the Apple store. So here I sit, hungry, tired, crabby. But I figured as long as I had the time and a nice laptop in front of me, I might as well knock out a review. It might distract me from gnawing off my own arm. So onto the book. This book was really cute, and an easy read. Prinny is a poor little rich girl, orphaned with a brother who despises her, and a lawyer who wants to protect her. I really liked her character, but can we not with the name Prinny? Short for Princess, of course. It was a super annoying moniker for a character who didn't annoy me at all. Chelsea works for Prinny and as a living statue (put another job on my never do list) as she struggles to make her big break. But her idea of a big break really isn't that big, as she's fighting for roles in local plays. She's a fake psychic who has learned to read people, so she works in Prinny's shop - even though Prinny has true psychic gifts, it doesn't seem to bother her that Chelsea is more of an empath and an actress than truly gifted. Diana is married to Lief, the aforementioned brother who hates Prinny and wants her inheritance. It is constantly insinuated that he could somehow get it away from her if she doesn't use it - you know, like opening psychic shops usually placates people who hate you. So as I type all of this - it sounds like the story shouldn't work, but it does. I found myself rooting for all three women, even dumb dumb Chelsea who drank herself into a really bad situation. I love chick lit, so it definitely worked for me, and I read it within a few days. it was the kind of book that helped you to relax. Right now, I'm reading Behind Closed Doors by B.A. Paris, and it is not relaxing at all. It's scaring the crap out of me. Freaks. One thing that seemed super weird to me was the cover of this book and the title. 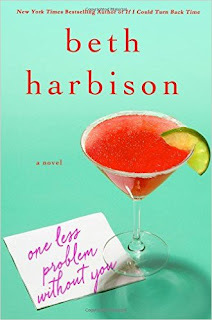 Neither one really fit into the story - it was really a cross between chick lit and magical realism, and the martini glass never really played a large role in the book. At least not that I noticed.